Comments: I have listened to Blackmore's Night's latest CD, Autumn Sky, several times over the last week. My first impression was that it has a much more commercial sound than their previous releases. The CD starts off in high gear with Candice's vocals on Highland reminiscent of late 70's to mid 80's pop rock material. The cadence and drumbeat on Vagabond allow the song to tell its heart wrenching story while keeping the energy high. Journeyman finishes out the first section of the CD with a rock out session and folk theme which could feel at home on a play list with Nightwish or Within Temptation. On track 4, "Believe in Me", we get a breather. As awesome as tracks 1-3 are, by this time in the CD, a good slow, relaxing track is well appreciated as we slip into some more typical (for Blackmore's Night) fare in Sake of the Song" and "Song and Dance (pt II)". Here we get a fun, playful cadence that evokes a picture of people dancing and having fun at some sort of ceilidh, carried away on the tunes played by whatever musicians happened to bring an instrument along. "Celluloid Heroes" may step out of the folk theme for a bit, yet does wonderful justice remembering all those people from the silver screen who did so much to entertain us through the years. A reminder of just how human the stars always are, this is a good song to relax, sit back, and think. "Keeper of the Flame" picks the tempo back up and brings us out of our reverie with the driving folk rock feel familiar from The Village Lanterne. "Night at Eggersberg" does a nice job of bridging the gap to "Strawberry Girl", and returning to that lovely mystical folk feel, where getting lost in the music feels like wrapping up in a spring breeze or a summer night and drifting on a dream. "All the fun of the Fayre" then kicks up the gypsy dance vibe a notch and gives a nice feel good piece to get up and dance to, as if you're at a party with human, fae, and spirit alike. Then "Darkness" keeps the theme going with a full fledged trip beyond the veil. The song says it best, 'Something in the darkness pulled me deeper'. This is one track I can't seem to get enough of. When it picks up tempo for "Dance of the Darkness" though, the mystical veil lifts and we're back at the fayre. Once we are fully back from the land of the Fae, the CD closes with two wonderful traditional pieces. A beautiful, bittersweet minor key rendering of "Health to the Company" and a beautiful, soft rendition of the classic folk ballad "Barbara Allen", including the beautiful and often omitted last verse. While Ghost of a Rose is still my favorite Blackmore's Night CD, and Under a Violet Moon may still be a better introductory album, Autumn Sky is a wonderful CD that I am very happy to have in my library. Journeyman, Vagabond, and Darkness have particularly been getting a lot of play time from me over the last week. About the only thing I really wish were different is that I wish it was available on vinyl. 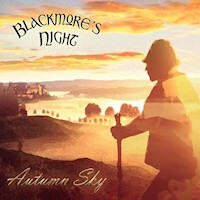 Want to write a review about Blackmore's Night's Autumn Sky album? Post your comments in this box to be displayed in our community forums and in our album database! Please make sure you are logged in before proceeding. Please login to write your comments about Autumn Sky.